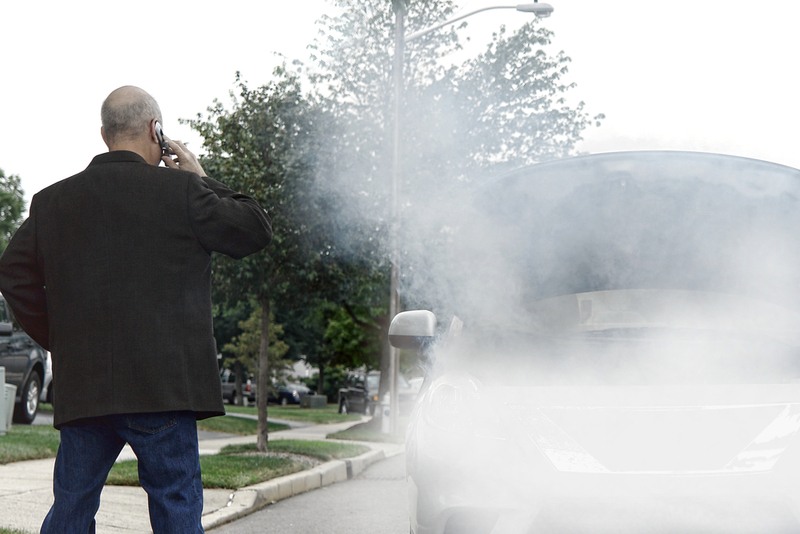 Here’s our list of top reasons for car breakdowns and how you can avoid them happening to you. The most common callouts for breakdown towing services are due to flat or faulty batteries. The most common problems are caused by terminals and clamp connections or by a loss of voltage. This is often caused by constant use on short journeys without regular recharging. At every service, check that terminals have been cleaned and protected from corrosion with a layer of petroleum jelly or grease. Clamps and connections must be secure. If you don’t often make a long journey, a fortnightly overnight charge prolongs battery life. Modern maintenance-free batteries need no top-up. Flat tyres and wheels cause headaches for a lot of motorists, particularly when they aren’t carrying a spare. Or, when the spare is flat too. The best way to avoid having to change a wheel at the side of the road is to regularly check your tyres’ condition to see if there is adequate tread or uneven tyre wear. Don’t forget to check tyre pressures, and look out for any damage to the tyre walls on a regular basis. Look at the spare tyre and check that the jack and wheel-removal tools are in good condition and that the key or removal tool for locking wheel nuts is accessible. Running out of fuel and filling up with the wrong type are both preventable. Empty fuel tanks cost a lot of time and inconvenience. Fill up at the start of your journey and well before the low-fuel warning light comes on. Every year more than 150,000 motorists put the wrong fuel in their car, with petrol in diesel the most common. If you fill up with the wrong fuel, do not start the car! Call your breakdown towing services provider to tow your car to a garage where it will be drained. Air conditioning issues and overheating are major reasons for breakdowns, especially in the summertime. Cooling-related faults also cause serious problems. Avoid overheating by checking the coolant level or asking your garage to check the system. Also, make sure there’s sufficient anti-freeze in the coolant for the winter time to avoid a frozen windscreen. Ignoring warning lights is a common reason for breakdowns, when motorists think they can make just one more journey. Park in a safe place as soon as possible and find out what the light means. Your owner’s handbook will give details. If, for example, you car is overheating and you ignore the warning light this could result in a very costly job to fix the engine. Of course there are those breakdowns that you just can’t prevent. If you do endure a breakdown, for a cheap and prompt 24 hour towing service in Melbourne, call Anytime Towing & Transport. We’re here to help, any time of the year!